I do not claim to be a huge fan of the iPhone version of Urbanspoon a free restaurant-finder that certainly has its advocates. To the pro-Urbanspoon crowd, the app offers a unique, iPhone-specific take on discovering nearby eateries—give the app a shake, and its slot machine-style interface randomly pulls up a restaurant based on neighborhood, cuisine type, and price range. To me, though, the whole thing felt gimmicky. More to the point, the iPhone’s screen doesn’t give Urbanspoon a lot of room to work its magic. You can find a restaurant easily enough, but if you want menu information, reviews, or directions, you had better be prepared to do a lot of tapping—or to abandon the app entirely when you fire up Maps. Urbanspoon’s creators should be especially grateful for the iPad, then. Thanks to that device’s ample screen real estate, Urbanspoon for iPad has room to spread its wings and finally fulfill some of the potential to be a great restaurant finder. The slot machine interface of the iPhone also finds its way to the iPad, and you can still give the tablet a shake to make the three wheels spin if that’s how you roll. But given the iPad’s greater heft, Urbanspoon’s developer wisely included a spin button that you can tap to set the wheels in motion. There’s a Map for That: The iPad’s larger screen allows Urbanspoon to fit in a map on its main screen, and that adds valuable context to the restaurant finder’s results. 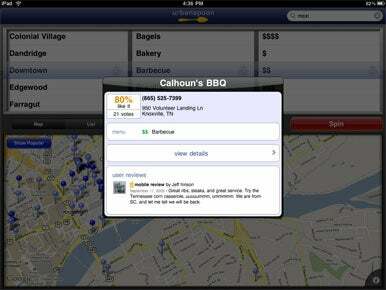 Things works mostly the same on the iPad version of Urbanspoon as they do on the iPhone or iPod touch. You can lock down your location, food type, or price range (or some combination of all three categories) to make your results a little less random. There’s also a search field in the upper right corner of the app if you’d prefer a more specific search. (You can only use this field to search by restaurant name, not by city, neighborhood, or food type; the app does produce a dynamic drop-down menu of results as you type.) When you launch the app, Urbanspoon asks to use location services to find restaurants near you, but you can also search in far-off cities by tapping the “i” button in the lower-right corner. The map in Urbanspoon for iPad adds some much-needed context that was lacking from the iPhone’s random results. While the iPad app doesn’t do a good job of telling you how close a particular restaurant is to your current location, it can at least give you some idea if that French bistro that sounded so promising involves a sojourn that rivals Frodo’s trek to the outer reaches of Mordor. If the map view doesn’t do it for you, you can switch to a list view of restaurants—a particularly helpful feature if you’ve locked in a neighborhood, cuisine type, or price range. There is a bug though—a pop-up listing how many restaurants matching your criteria appears right in the middle of the list, forcing you to scroll around it, if you want to peruse the results. In the iPhone version of Urbanspoon, getting more information on a particularly eatery meant tapping your way to a new screen. Things are different on the iPad—all you have to do is tap that pane that appears on the map. That summons a new info pane with the restaurant’s phone number and address along with a few capsule reviews. Need more info? Tapping a View Details command brings up a separate screen with even more information about the restaurant—all within the app itself. Some listings even include a sample menu, though that feature seems to be pretty hit or miss. The More Details screen also includes a way to get directions to the restaurant, though you’ll have to type in your starting location—there’s no tapping a Location button as you would in the Maps application. Pop In for Dinner: Tap a pinpoint on the Urbanspoon Map, and a pop-up menu appears with more details. If you want an even more detailed view, just keep tapping. Urbanspoon for iPad requires a network connection to download restaurant information—not a problem if you’ve got a 3G-capable iPad and a data plan with AT&T, but kind of a non-starter if you’re on a Wi-Fi iPad and there’s no Internet connection handy. What do you when you’re looking for a place to eat under those circumstances? You go hungry, I guess. 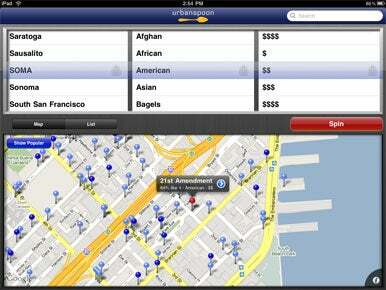 The recent 1.1 update to Urbanspoon for iPad delivered improved performance and bug fixes. There are still few bugs to iron out as that glitch with the List view entries. And I’d like to see the app make better use of location features for helping you actually get to the restaurants the app discovers. Tackle those tasks, and Urbanspoon will become an indispensable dining companion. As it stands now, this iPad release will have to settle for being a decided improvement over the iPhone version.